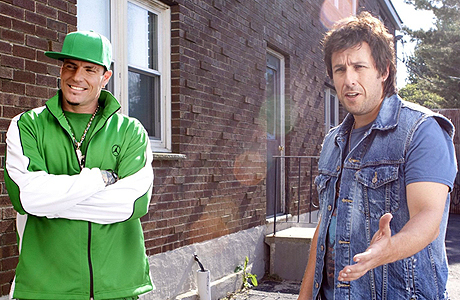 I have spilled a lot of proverbial ink (most recently in my Jack and Jill review) about how I repeatedly hoodwink myself into watching Adam Sandler movies. I estimate that I have sworn off Happy Madison productions at least ten times. So when Sandler’s latest movie That’s My Boy dropped, I told myself to stay strong. I knew at some point, I would see it (I admit as much in the June Movie Guide), but I didn’t want to shell out $15 to see this train wreck on the big screen. I am here to report with mixed feelings that I caved in. The movie is a complete mess, but that’s not to say there aren’t some very funny moments. The plot is loosely based on the Mary Kay Letourneau story about an inappropriate student / teacher relationship that results in the birth of a son. 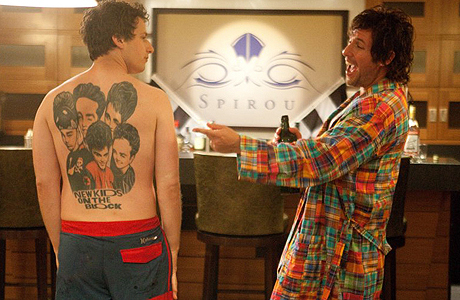 Adam Sandler plays the student some 30 years later and Andy Samberg the estranged son. Sprinkle in some elements of childhood stardom, 80’s nostalgia, the usual slew of celebrity cameos, and the grotesque shattering of social norms and you pretty much get an idea of what’s going on in the film. My expectations for Sandler’s movies are so low that it could have been two hours of a blank screen and I probably would have considered that an improvement so that may be a contributing factor as to why I didn’t completely loathe the film. The one thing that is clearly happening in this project is that Sandler and his crew are trying to go bigger and badder in the raunch department in an attempt to capitalize on the increased popularity of the rated-R comedy. The result is a slew of cringe-worthy moments flanked by the occasional laugh-out-loud moment (the latter of which has been painfully absent from his last five films). The cast of the film is mediocre and Sandler is up front and leading the way. He seems resigned to using the scratchy rumbling voice inflection from Little Nicky, which can be incredibly grating on the nerves. Samberg compliments him with an uninspired performance that makes one wonder if he should really be leaving SNL at this point in his career. As for Leighton Meester, her greatest acting talent is bearing a strong resemblance to Minka Kelly, which is to say that she is not the most gifted thespian and so she adds very little to the film. Those with minimal screen time deliver the best performances. Eva Amurri Martino, James Caan, Tony Orlando, and Milo Ventimiglia are very solid in supporting roles and Vanilla Ice (Rob Van Winkle) steals the show. I can’t outright recommend this film, but there is some entertainment here. You will find yourself oscillating between liking it and loathing it depending on the scene. It really is one of those movies you’re almost embarrassed to say that you enjoyed on some level. Don’t see it in the cinema, but instead catch it as a rental or on cable. You’ll have a laugh or two (and likewise a gag reflex or two). I have a feeling that this movie will play very well for the 18-25 male demographic, but then I think we all can occasionally enjoy a bit of low low low-brow idiotic hijinks. After reading this review, if you are still trying to figure out whether or not I liked this film, then join the club. I am still trying to decide myself. Standout Performance: Vanilla Ice a.k.a. Rob Van Winkle steals the show in this movie. Every time he shows up on screen utter bedlam breaks out.